Second from the top in Aiwa's line of detachable speaker boomboxes, the DW635 can do double duty as a budget second stereo at home and a power portable music box on the road. 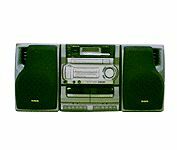 The CA-DW635's most unique feature is a front-loading CD player that's just like you'll find on a typical component piece. It's much more reliable (and fun to open and close!) than the top loaders found on lower-end boxes. Aiwa claims its Q Surround provides the illusion of having rear-surround speakers, but don't expect to be looking over your shoulder. The CD can handle 30 tracks in its program memory and will automatically link to the cassette deck (for recording tapes) with a touch of a button. The tuner is digital, which gives you better reception and allows you to program preset stations. Because the cassette decks aren't full-logic, you can't control them via the included remote. The 635 does have a bass boost, and Aiwa says its Super T-bass boost circuit is specifically engineered for improving smaller speakers' bass response. I've had this bad boy, oh man, maybe when they first came out and still kicking strong. I use all the features given. It definitely can be an extra portable system around the house, parks etc.... apart from your main sound system even attaching your I-POD, Kindle-Fire and maybe my new Apple-I PAD and a very versatile component type player. I was just curious to know if there's anybody else owning one of these, I thoroughly enjoy this unit. Cassettes players are out now, not even in cars anymore unless you find one in BEST BUY, TARGET or some archival type specialty store maybe Radio Shack. I still have a whole lot of cassettes left that haven't been digitilized yet. But I enjoy the robust surround sound when I drive to destinations of say, 500 to 600 hundred miles. Of course this system is outdated but it is a good old standby especially since its portable with a remote.